The Jackson Hole Ski Swap is such a deal – not only are the prices hard to beat, most of the time, but you get into that kind of party atmosphere and excitement as part of a large, anticipating crowd. Correctly called the Jackson Hole Ski Club Ski Swap, it is a fund-raising effort for the Jackson Hole Ski Club – 25% of the sale price goes to help those young athletes train and compete against regional competition. 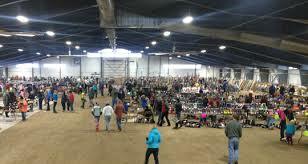 The Jackson Hole Ski Swap is an annual fundraising event hosted by the Jackson Hole Ski & Snowboard Club. Local and regional vendors as well as local ski enthusiasts will be selling new and used Alpine, Nordic and Snowboard equipment and clothing. Please come along if you have gear to sell or need something for the upcoming season. 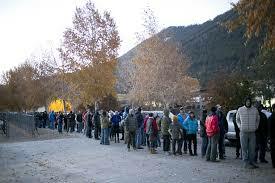 The Jackson Hole Ski Swap is an annual event, always held the last weekend of October. Hundreds of people line up at the doors on a frosty late October morning – all in down jackets, wool hats and Sorrel boots – yes, another Jackson Hole ski season is on the horizon and the tempting ski flicks by Teton Gravity Research and Warren Miller have already made the rounds – amping-up the excitement. Memberships to the Jackson Hole Ski and Snowboard Club are $30 and provide hundreds of benefits and discounts at local businesses throughout the winter season. 6:30am – Coffee from Elevated Grounds and burritos from Pica’s on site! All profits to benefit the JHSC Scholarship Fund 7:30am -The Early Bird gets the Worm! Come early to get the cream of the crop at the Swap! Early Bird admission is ten dollars or five dollars with your Ski Club Membership Card. Paying for early admission is definitely worth the price because you get the pick of the good stuff and a relatively uncrowded experience. 8:15am- Doors open for the public. General admission is one dollar or free with your Jackson Hole Ski Club Membership Card. Please bring your membership card or purchase one at the door. Items not sold during the Ski Swap must be picked-up between 2pm and 4pm. Please bring your paperwork to retrieve unsold items. Items not picked-up by 4pm will be considered a donation and taken to the Sublette Ski Swap. 5:00pm – 7.00pm – Get a massage at Jackson Hole Massage Professionals. It wouldn’t be Halloween in Jackson Hole if it wasn’t for Snow King Resort – they’ve held the biggest ‘do’ in town for some years now. 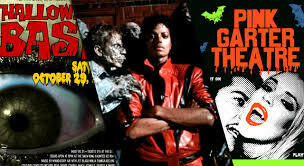 It’s known as the KMTN (a Jackson Hole Radio Station) Halloween Bash, and it attracts hundreds of scarily – costumed revelers. There’s a live band, costume competition, silly games…and beer. This is a late night adult party – so use a designated driver or the tipsy taxi service. It’s usually cold having Halloween in Jackson Hole, and costumes aren’t known for their warmth – so almost every neighborhood in Jackson has haunted houses and mazes for the kids to enjoy – with adult supervision. 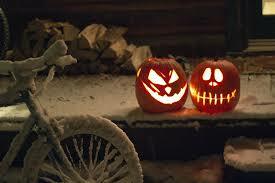 Enjoy your Halloween in Jackson Hole. The Jackson Hole SHIFT Festival is yet another festival to write about this fall. There’s been the Jackson Hole Fall Arts Festival, the Jackson Hole Fall Film Festival (Frank’s Fall Film Festival), Jackson Hole Music Festival, Grand Targhee Music Festival – wow – Jackson Hole is the place to be for festivals. The Jackson Hole SHIFT Festival is all about saving the environment – or at least how one company, Jackson Hole Mountain Resort, throws a party in order to advertise it’s sustainability practices. It’s a way to get the public involved and is, overall, a coming-together of people (mostly locals this time). There’s FoodSHIFT, where the sustainable practices in food purchasing and production are explored – and of course the tasting of gourmet food. The SHIFT Summit showcases how local communities in North America, such as Jackson Hole, can make a difference – and share their knowledge with other like-minded communities. There’s a presentation called ‘Tools for Tomorrow’, inspired by Patagonia’s ‘Tools for the Grassroots Activist’, and modeled on the Jackson Hole Conservation Leadership Institute. This program teaches skills needed to plan and win a conservation campaign. For Adventure lovers, Outside SHIFT Festival also brings mountain biking, fishing, wildlife-watching and more. Free guided bike rides and walks will show-off Jackson Hole’s extensive pathways. Guide companies will offer nature excursions at reduced rates, as will some fishing companies and mountain-bike guiding companies. Teton Gravity Research gets in on the act too, of course, with their latest spectacle ‘Higher’. Sponsored by Subaru Jeremy Jones’ jumps can be seen at the Jackson Hole Center for the Arts. There’s also the Jackson Hole Wilderness Rendezvous – a celebration of the 50th. anniversary of The Wilderness Act, and the Jackson Hole Film Festival is finished at the National Museum of Wildlife Art with a presentation by Barry Lopez, who discusses the relationship between human culture and physical landscape. 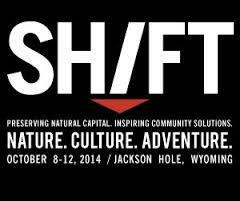 The dates of the Jackson Hole SHIFT Festival are Wednesday, October 8th. until Sunday, October 12th. The fall colors will be in their last throes of brilliance – why not come out and join us? Yes, the year of 2014 is the year of the Jackson Hole Centennial. The town of Jackson, Wyoming, was incorporated in 1914 – on September 21 to be precise – and we’re just three short weeks away from that date. And when you think about it – it wasn’t all that long ago, and to see images of Jackson then, compared to what it is now – wow – what a hundred years can do to ‘progress’. So what do the locals do to celebrate the Jackson Hole Centennial? 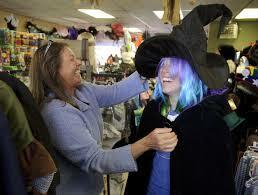 Well- there have been events all summer for visitors and locals alike. There was a huge Centennial Community Picnic at Miller Park, the 4th. of July Parade had a special flavor especially for the Jackson Hole Centennial, and coming up, on September 19th. Come along and help the Teton Raptor Center, the Jackson Hole Land Trust, and the Jackson Hole Historical Society have a ‘BARN-TASTIC’ evening at the Center for the Arts to celebrate the iconic Mosely/Hardeman Barn. There will be live music with barn dancing, a film (see promo at https://vimeo.com/78426914) a discussion and wildlife art exhibits. There will also be a ‘Treasure Hidden in Plain Sight’ event. For those into something more peaceful than barn dancing, there will be a quilting demonstration on September 20th. from 10am – 2pm at the historic Miller House in the National Elk Refuge. Also on September 20th, the Jackson Hole Centennial will be celebrated with the Centennial Gala – that will be at 6pm. As reported in my most recent blog post, one of the bog deals of the celebration will be the Lynyrd Skynrd concert happening this evening (August 31st.) at SnowKing Ball Park. And of course there’s something you can also do to help celebrate a hundred years of Jackson Hole and that’s – Get a Massage, we here at Massage Professionals of Jackson Hole can arrange for your massage without all that organization and planning. 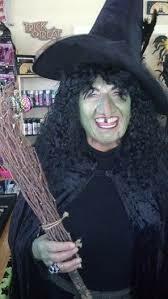 Just give us a call at 307 413 1961. If you’re a local, Jackson Hole Summer Concerts (aka Jackson Hole Live) become a habit, and a place to meet your friends on a regular basis. If you’re a visitor – it’s just one more thing to add to the plethora of ‘gotta-do’ activities during your stay. Visitors and locals alike mingle at Jackson Hole Summer Concerts, and it’s a great vibe. The concerts are held at the Snow King Resort Ball Park, 100 E. Snow King Avenue, every Thursday evening from (with some exceptions) throughout July and August. And, boy, do we have some high-caliber acts – on Sunday, August 31st. no other than Lynrd Skynyrd is showing up to strut their stuff at the next of the Jackson Hole Concerts. I imagine people from all over Wyoming and neighboring states will travel to Jackson Hole for that one. They are coming to help us celebrate Jackson Hole’s Centennial year – 2014. (More about the Jackson Hole Centennial in my next post.) Some other bands to grace Jackson Hole with their presence this season have been: Trombone Shorty & Orleans Avenue; Craig Campbell and the Black Lillies, Johnny Swim and Playing for Change. Meanwhile, there are more Jackson Hole Concerts held at Teton Village Commons – Concerts on the Commons. This summer Jackson Hole Mountain Resort has hosted Calle Mambo, Jazz Foundation of Jackson Hole, Mandatory Air, Reckless Kelly, The Congress and others. Young Dubliners, Maddy & the Groove Spots, The Motet, and Hayes Carll. The quality of the music is high. The bands are tight, professional, superb entertainers and at the top of their games. The musicians play hard and are obviously well-rehearsed and perfectionists at their instruments. Sometimes it looks as if such repeated motions must hurt as a result of overuse injuries. We, at Massage Professionals of Jackson Hole, offer musicians’ massage to visiting performers. We thank all sponsors of Jackson Hole Summer Concerts for putting on these great shows. This is the third in a series of three articles about hot springs near Jackson Hole. Of course, ‘near’ is a relative term – so I’m talking about drives of ninety minutes or so from the town of Jackson, Wyoming. And this all started with the question: what do Jackson Hole Massage Professionals do during the off-seasons? – And just about any other local who gets to stick around for the slow times. – which is South of Jackson Hole off Hoback Canyon on the way to Pinedale. It takes about 45 minutes to get to the Granite Creek Junction, deep within Hoback Canyon (Granite Creek is a tributary of the Hoback River). From the junction there, it’s ten miles east on a well-graded (mostly) dirt road to the hot springs. It’s a bumpy, dusty, stunningly beautiful drive up there – deep into the Gros Ventre Mountains which are massively high in the background behind the hot springs camp site. The camp site itself is lovely – not to do with the hot springs themselves…no – this just happens to be a Forest Service camp ground nearby – and it’s a great value at $14 per tent site. (Last time I looked.) Anyway – great spot of you’ve got a pop-up camper and want to spend some fun time in the out-doors, surrounded by Pine forest. In winter it’s a popular snow mobile destination – but in my view that kills the whole idea. It’s a long way on skate or classic Nordic touring skis – but do-able and the hot springs afterwards is a treat. 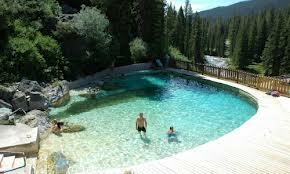 You don’t have to pay to go into the hot springs pool itself – there’s another hot spring in a rock wall and there are pools below to catch the hot water – which mixes with Granite Creek itself to cool it down. This is a neat spot because a major waterfall roars right beside you. Not bad for hot springs near Jackson Hole. The hot springs pool is different from the other two mentioned. It’s completely open with just a short fence around it – and it’s curved outer wall hugs a mountain alcove – down whose slippery walls runs this steaming hot spring water. 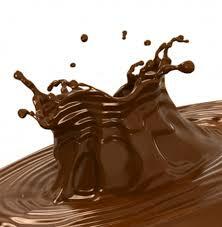 Where the water falls into the pool – is where it is hot. The further you move away from the source of the spring – the cooler it gets. So it’s fun to cruise in and out of warm and cooler zones that circulate the pool. Right in against the cliff is where you hand out for warmth. There’s no specific temperature set for this pool as it is affected by snow-melt. The pool is an azure, milky blue and of course it’s just dreamy to be there like all the rest of them. Rochelle celebrated her birthday for the second year at Heise Hot Springs just last week. There were about sixteen of us (not all massage therapists) and we all made the pleasant drive over Teton Pass, then Pine Creek Pass (turn left in Victor, ID), past the ‘World-Famous’ Square Ice-Cream Store at the Swan Valley Junction. The hot pools and buildings themselves are standard fare, though a handsome old two-story brick house with dormers dominates the scene. That’s where the owners live. There’s an open-air ‘warm’ swimming pool (92’F)- surrounded by walls to keep out the weather, and at one end of that, covered by a canopy, is the hot pool – kept at 104’F. We found this to be a delightful temperature to hang out in for half an hour at a time. These two pools are kept open all winter and it’s a wonderful way to spend a day when skiing just doesn’t sound that great and the longs months of winter in Jackson Hole are getting OLD. If lazing around in warm or hot pools isn’t your ball of wax – and you have kids with you – then in the summer time there’s a whole plethora of activities: zip line, open air swimming pool (open only Memorial Day through Labor Day), flume, RV and camping, gorgeous park by the river with picnic tables and BBQ grills. When we were there, the willows overhanging the river were just coming into leaf – like in the photo here – and it was a beautiful scene. – and there’s even golf. Pizza can be had at a basic small restaurant on site – and it’s nice to sit out there on their sheltered deck and watch the golfers coming in. But we were there just to ‘chill’ – or, I should say, warm up while we chilled – oh well…you know what I mean. 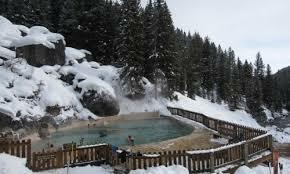 Next week…another hot springs near Jackson Hole – Granite Creek. We’re deep in the off-season now in Jackson Hole. And the weather can be ‘iffy’. What do massage therapists and other seasonal workers in Jackson Hole do with themselves in the off-season? One of our favorite things is to go to hot springs – all of which are about 90 minutes from Jackson. 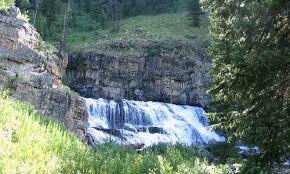 Rochelle and I paid our first visit to Green Canyon Hot Springs recently, This is on the way to Rexburg, Idaho. To get to it from Jackson Hole, you have to drive over Teton Pass to Victor, north to Driggs and then towards Rexburg. The Green Canyon Hot Springs is about half-way between Driggs and Rexbuirg – four miles south at highway mile marker 116 on Hwy 33 in the northern foothills of the Big Hole mountains – which flank the western edge of Teton Valley, Idaho. I can’t believe I’ve lived in Jackson Hole for thirteen years and never been there before. It’s an absolute delight. There are two pools – one is an Olympic sized swimming / playing pool with temps of about 96’F, the other pool is pure relaxation with temps at about 105’F. These are fed from a spring that emerges from the ground at 115′. 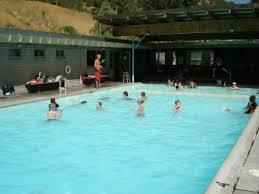 The hot springs have been run by the same family since 1953 – the present building was built in 1947. It’s definitely showing its age and needs some TLC – but then there’s just tons of character. The hot pool area itself is what one might imagine as ‘Heaven’. It’s like a greenhouse and all painted a light blue. There’s a surreal feeling of peace and well-being. (Hence relevant to this massage blog.) The temperature of 105’F is a little much to stay in for long – but steps emerge from the pool and you can submerge yourself in there as little or as much as you like – and of course take a dip in the cooler pool when you need to. Speaking of which…there’s a ‘Plunge Pool’ at 55’F – quite a shocking quick dip in there will do much to cool you down, that’s for sure. Overall, an afternoon there (or a day – take a picnic – or a couple of days – go camping with the kids) is relaxation defined. Ahhh…we love off-seasons on Jackson Hole. Next week I’ll talk about the other two hot springs near Jackson Hole – Granite Creek, up Hoback Canyon, and Heise Hot Springs – also in Idaho but on the way to Idaho Falls. If you’re looking for some deep wisdom about massages, giving massage, receiving massage, the benefits of massage, the business of massage – you might not wish to read on. Occasionally I digress into discussion about life in Jackson Hole – as lived by massage therapists here. Overall – we lead not such a bad life – especially when it’s end-of-ski-season PARTY TIME. As I write this post, Rochelle – otherwise an almost completely sane massage therapist in Jackson Hole, has gone skiing with a tutu round her waist and a small stuffed bird attached to her shoulder. Yes folks, it’s ‘Gaper’ Day on the slopes of Jackson Hole Mountain Resort. As if concerts by Karl Denson, Blues Traveler and Michael Franti weren’t enough – it is PARTY WEEK here in Jackson Hole. Over the weekend we had the ski-season-end multi-faceted race – the PPP (Pole Pedal Paddle) – but we’ll get back to that soon. Meanwhile – back to Gapers…What’s a Gaper? You might ask… Well – it’s a rather derogatory term for people who are well behind on the ski fashion curve – to put it mildly. It’s a throw-back and a poking of fun at how absurd ski fashions looked – oh just so recently – and how we thought we were so cool in wearing them. The day (usually April Fool’s Day or thereabouts) when all the mountain employees and locals who don’t have to work dress up in absurd tourist outfits and imitate all the dumb gapers we have to deal with the rest of the year. Usually involves lots of neon clothing, ridiculous stunts, and massive amounts of alcohol. Now, this isn’t to say that Jackson Hole has dibs on Gaper Day – no way – it’s a phenomenon that has spread throughout ‘cool’ ski resorts all over the country (and maybe Europe for all I know.) But frankly – it’s hilarious wherever it takes place. The other thing I mentioned above is the Pole Pedal Paddle, or PPP (which this year has added two additional legs for the first time and so it becomes the PPPPP). As the name suggests, it a multi-legged, multi-skilled race from the top of Jackson Hole’s aerial (the first leg is on Alpine skis) tram to a place on the Snake river many miles away and several thousand feet lower on the banks of the Snake River (the last leg is in kayaks or other river craft). In between those two legs, there’s Nordic (cross-country) skiing, and road-biking. There are ‘serious’ race classes, where athleticism counts and winning is a serious goal. There are more casual classes, where simply competing and completing the course is the goal; there are relay teams if all of the various skills are better shared among a group of friends or business colleagues; and then (again), there’s the ‘party’ class – where costumes count and nobody really cares who completes what – just get the prize for the best costume. Again, this race is not just a Jackson Hole thing – many ski resorts, with a river nearby, will have their own PPP races. It’s a great and fun event for all. Entry fees and other fund-raising activities to to help finance our very own Jackson Hole Ski and Snowboard Club. Teams are formed by local companies – whether serious, relay or costume based – and the whole thing helps, among this entire week of festivities, to round-out yet another ski season at Jackson Hole Mountain Resort. Yet the end of one season is the beginning of another. Whilst many may lament the end of ski season – well, we’ve had it since November and it’s time to move on…spring and summer in the Tetons are just around the corner – and I’ll have lots to write about that in my next post.